Has VMware changed DR or has DRaaS changed VMware? The annual virtualization soirée known as VMworld presents insightful strategy and platform announcements for vCenter, vSphere, and a myriad of other valuable applications. Each year VMware positions itself as the digital infrastructure provider for the software-defined data center and continues to extend its effort into hybrid and multi-cloud environments. With the growth and exponential explosion of data, the 2018 VMworld Conference has become reminiscent of a storage conference with nearly ½ of the vendors having a storage or cloud position. It’s no wondering why organizations today are now looking to the cloud as a viable, cost-effective alternative to protect against the pitfalls and inefficiencies of traditional VMware backup and disaster recovery (DR). The increasing pressure on IT teams to maintain information governance and business continuity is changing how organizations are viewing long-term data retention and infrastructure resiliency. Organizations today are looking to the cloud as an alternative to traditional backup and disaster recovery strategies to provide a viable, practical solution without costly egress fees. Typically, managing the backup and restore of virtual machines is an intricate process. In addition to involving multiple staff members, there is a complex infrastructure dependent upon cumbersome, error-prone, multi-tiered systems resulting in high costs for data availability and IT resiliency — putting your business continuity at risk. It may seem like eons ago that VMware released Site Recovery Manager (SRM) to replicate VMware VMs and network configurations to a recovery site. Today, SRM is a DR platform for VM failover and failback to and from a recovery site with limited mechanisms for DR testing. The question is, did VMware lead the DR industry with Site Recovery Manager – and is it still a leading DRaaS platform? Moreover, what difference does that make to your DR choices today in your VMware environment? 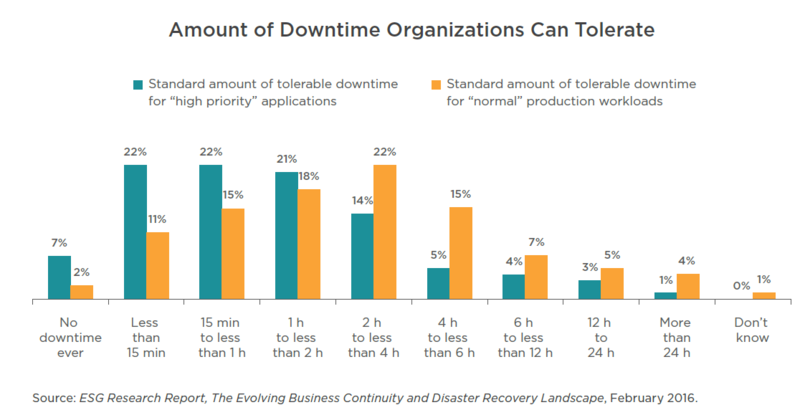 When VMware introduced SRM, disaster recovery meant a process of mirroring the production environment to a hot or warm secondary physical site. With SRM, VMware admins would have to failover critical data, VM configurations, and network settings to a highly available secondary data center. 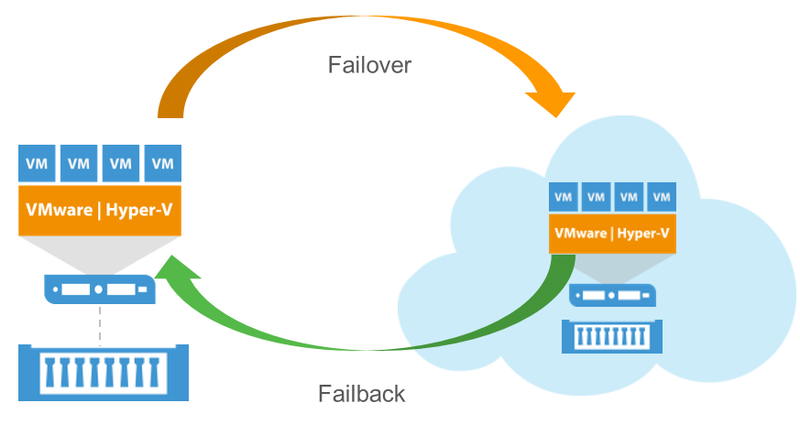 Unlike common storage array-based failover services, VMware SRM does not specify a single proprietary storage array for replication and failover. However, SRM does require that both primary and secondary data center arrays offer array-based replication, and the replication adapter must be VMware-approved and integrated with SRM. High speed/high bandwidth is also a requirement for connecting sites, and VMware strongly suggests VPN connections to maintain security when the secondary site takes over processing. To further support seamless failover, the secondary site needs to have the same access to networks as the primary site does. VMware also requires at least a single vSphere license at both primary and secondary sites. If this all sounds expensive, you’re right — it is. Additional storage arrays for the recovery site and additional VMware licenses hit both CAPEX and OPEX budgets. Why VMware Site Recovery for VMware Cloud on AWS? Announced nearly a decade after SRM, VMware realized the need for disaster recovery in the public cloud. Based on SRM, the offering operates replication and DR self-services in a cloud (not the cloud) instead of maintaining a second hot/warm recovery data center. Adopting a DRaaS data protection strategy is a big step away from VMware SRM’s high capital and operating costs. The folks at VMware took a step closer by creating a software stack for DR based upon the VMware platform but may have come up short in offering an on-demand service only for the AWS and Azure megaclouds that offer only DIY services, limited SLAs, and unpredictable billing. VMware Cloud (VMC) on AWS. Note the VMware Cloud on AWS name: this DR is a VMware add-on that runs exclusively on VMware Cloud in AWS. VMware SR is a self-service offering that protects workloads between on-premises data centers and VMware Cloud on AWS, as well as between different instances of VMware Cloud on AWS. Azure Site Recovery for VMware. Azure Site Recovery – again, note the difference in the name -- is an Azure offering, not a VMware one. Azure SR is a DRaaS for heterogeneous environments including on-premises VMware, VMware workloads in AWS, Hyper-V, and bare metal restore. This means that DRaaS for VMware is limited to just two hyperscale clouds with their specific DR technologies for VMware – not exactly meeting the SLA, cost efficiency, or managed services that’s preferred in the age of the multi-cloud. Cloud service providers (CSP) should provide customizable DRaaS based solutions, so you can be up and running in minutes with a complete, tested, enterprise-grade, DR strategy. Is implementing VMware Cloud on AWS, DRaaS? The VMware Cloud on AWS is an on-demand service, powered by VMware Cloud Foundation, and offers its SDDC stack to the megacloud which integrates compute, storage and network virtualization products (VMware vSphere, VMware vSAN, and VMware NSX) along with VMware vCenter Server management. VMware Cloud pricing can appear expensive with per host per hour fees and the requirement to have at minimum four hosts with all the trimmings which, when taken into consideration might lock-out SMB and mid-market organizations. "Disaster Recovery-as-a-Service (DRaaS) is the duplication of physical or virtual servers by a third-party to provide offsite failover in the event of a man-made or natural data failure." - Industry definition. VMware has positioned VMC as a disaster recovery as a self-service that allows you to protect vSphere-based on-premises infrastructures by operating within a megacloud from AWS or Azure. Please note the carefully placed mentions from VMware in which VMC on AWS is an on-demand service, which means this is a software suite sold and supported by VMware but not offering the as-a-Service portion of DRaaS. Your option is to have a DIY on-demand DR software stack or to look for a third-party to provide a comprehensive backup and DRaaS strategy. The benefits of VMware Cloud may be unattainable for many SMB and mid-market organizations while not worth the cost for some enterprises. Since VMC on AWS provides a complete VMware stack (ESXi, vSAN, NSX, and vCenter) that runs on top of dedicated AWS hosts, this means that your accounts are entirely separate from any standard AWS account. Several independent studies tend to show that VMware Cloud on AWS comes with a significant premium price point when compared to the already complex pricing model of standard AWS. Breaking down the VMware Cloud on AWS pricing is no easy task, given the range of options, services, and incentives. In the long term, it’s not clear if companies will pay a premium for a basic cloud migration stack that can be more easily and cheaply acquired from a variety of cloud providers that offer true DR as-a-Service assistance. There is an option to achieve a hybrid-cloud by adopting a data resilient DRaaS strategy. A comprehensive plan will provide the ability for both backup and replication of workloads to the cloud, as well as offering to backup out of the megacloud for multi-cloud or cloud migration purposes. It is essential to have the flexibility to leverage existing on-prem investments in a VMware Software-Defined Data Center (SDDC) and still meet today’s cloud service level objectives while enabling the recovery of any app, any data, on any cloud within minutes. For organizations seeking business continuity and aaS solutions, the ideal choice is to partner with a customizable cloud provider for data protection, disaster recovery, and the security of managed services. Instead of the DIY megacloud’s one-size-fits-all model with non-customizable SLAs, the high cost of egress, and Site Recovery service fees, VMware admins can achieve efficient and secure backup and DR services from a CSP providing a holistic approach to data protection. DRaaS is about adding availability to your business without added hardware costs; it’s about feeling confident that your business can scale up or down without friction; it’s about getting to the cloud quickly and efficiently without being mired in hidden cloud fees; it’s about maximizing your existing VMware investments. Accelerate time-to-protection. Remove the need for a secondary DR site and implement DR in hours not days. Automatically failover VMs. Streamline operations with automated failover and failback and simplify ongoing maintenance and non-disruptive testing. Stay in compliance. KeepItSafe’s secure and redundant architecture protects client security and regulatory compliance requirements. Efficiently backup VMs. DRaaS solutions can quickly backup snapshots from storage arrays and create image-based backups and as often as needed without performance overhead. Flexible backup and DR. Backup VMware vSphere through a secure, single-port connection to a KeepItSafe custom cloud. Megacloud users can provision resources and adopt a multi-cloud strategy by backing up their VM workloads and vital data out from public megaclouds. Managing VMware SRM or VMware Site Recovery is expensive and complex. By working within the KeepItSafe ecosystem, you can safely off-load VM backup and disaster recovery management tasks while experience application and data availability. Achieve data availability and choose a custom cloud to backup and KeepItSafe.